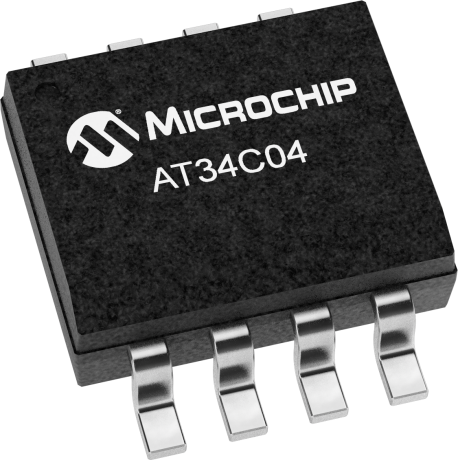 The Microchip AT34C04 is a 4 Kb Serial EEPROM utilizing an I2C (2-wire) serial interface. The device is organized as one block of 512 x 8 and is optimized for use in consumer and industrial applications where reliable and dependable nonvolatile memory storage is essential. The EEPROM is available in a variety of space-saving packaging options with an operating range of 1.7 to 3.6V. The AT34C04 is tailored specifically for DRAM memory modules with Serial Presence Detect (SPD). The device incorporates a Reversible Software Write Protection (RSWP) feature enabling the capability to selectively write protect any or all of the four 128-byte quadrants.